Everyone who has a brain is at risk to develop Alzheimer’s, the only top 10 cause of death in the United States that cannot be prevented, cured or even slowed. Go Purple: Throughout the month, Go Purple – the color of the Alzheimer’s movement – to raise awareness of the disease. Dress in purple and turn your social media purple by sharing photos! Click here for more ways to Go Purple in June. Share: Help raise awareness of the impact of Alzheimer’s disease by sharing your Alzheimer’s story and reading the stories of others who are facing the disease (#ENDALZ & #MyAlzStory). Show your love: On the summer solstice, June 21, 2018, people across the world will join the Alzheimer’s Association The Longest Day® to do an activity they love — or an activity loved by those affected — to help end Alzheimer’s. Visit alz.org/thelongestday to learn more. Click here to see a list of The Longest Day events taking place throughout West Virginia. Educate: Share the facts about Alzheimer’s disease with everyone you know. Get started at alz.org/facts. Learn: Attend one of the many free, educational workshops taking place throughout the state. 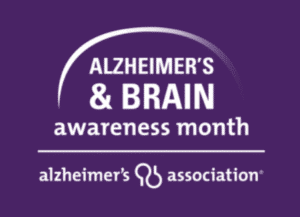 Visit alz.org/wv for dates & locations. To learn more about how you can help the Alzheimer’s Association #ENDALZ during Alzheimer’s & Brain Awareness Month, visit alz.org/abam. Call them at 800-272-3900 for more information.